Brine is a byproduct of crude oil production. 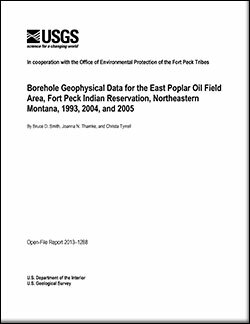 Handling and disposal of brine during the last 50 years in the East Poplar oil field has resulted in contamination of not only the shallow Quaternary aquifers, but also the Poplar River. 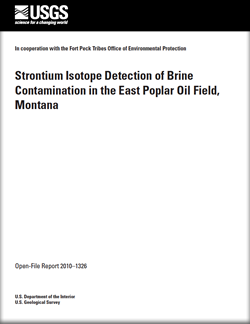 Previous investigations have documented and partially delineated the extent of brine contamination in the East Poplar oil field during the early 1990s. 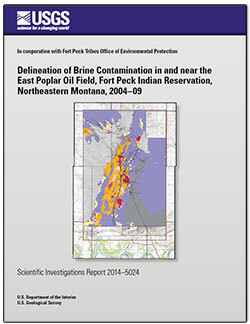 In the 10 years since the last USGS study ended, the extent of contamination has changed and may have grown larger. Brine-plume migration is toward the nearby City of Poplar, which, at present, relies on the shallow Quaternary aquifers as its sole source of water. The objective of this project is to more fully delineate brine contamination in shallow aquifers in and near the East Poplar oil field. The project area includes the entire East Poplar oil field, much of the Northwest Poplar oil field and the City of Poplar. Results of the study are detailed in Thamke and Smith, 2014.